Is The Experience API Backward Compatible with SCORM? Is xAPI Backward Compatible with SCORM? No, it’s not. And, dude, you’re totally missing the point. xAPI is a new paradigm. To make something backward compatible means to live within the constraints of old. The constraints of SCORM have been holding us back for years. Innovation and progress require change. Embracing xAPI will require change; change to how we think as well as to how things work. Change is the price of progress. Is streaming download backwards compatible with DVDs? Is the car backwards compatible with horse and buggy? Is the electric light bulb backwards compatible with candles? In each case, the newer technology is radically different than the old. The newer technology allows you to do what you did before, but in a much better way. The newer technology requires effort and change to adopt, but the result is a massive improvement in utility. Such is the case with xAPI. According to Wikipedia, “a product or technology is backward or downward compatible if it can work with input generated by an older product or technology.” A xAPI Learning Record Store (LRS) is not required to accept SCORM packages, therefore xAPI is not backward compatible with SCORM. But the story doesn’t end there. Just because xAPI itself isn’t strictly backward compatible doesn’t mean that the products you use are going to abandon backward compatibility. It is possible, and actually quite common, for a product to be backward compatible even though the standard is not. 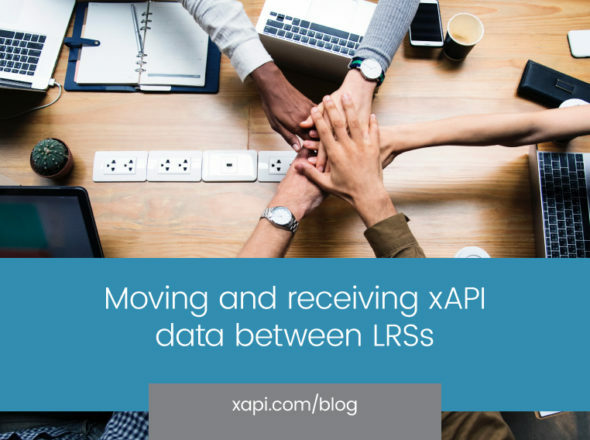 Your LMS isn’t going to stop playing SCORM content just because it can also accept xAPI statements. You can still light a room with a candle even though you have a light bulb. You can still play a DVD in your home entertainment system even though you can also use Netflix. The products that you use will most certainly start to adopt the Experience API, but it will be a long time before they stop supporting SCORM. There is too much critical mass behind SCORM for it to go away anytime soon. I suspect we will see innovative new startups building xAPI-only products (think Roku, Boxee, Hulu), while existing vendors will incorporate xAPI functionality into existing products (think Sony, Samsung or Panasonic DVD players with Wi-Fi and “smart apps”). The point is, that even with the rapid uptake of xAPI we expect, you won’t need to change what you are doing if it is working for you. If something is broken, or there is something new you want to do, xAPI will probably be a godsend. If you’re happy with the way things are, you can leave things just the same.